The PEPSO installation consists in simulating a space environment on the ground to test instruments, nanosatellite platforms, and the interactions between the two. The PEPSO installation consists in simulating a space environment on the ground to test instruments, nanosatellite platforms, and the interactions between the two. The simulated plasma is close to the ionospheric conditions, which corresponds to the environments encountered by satellites in low orbits. 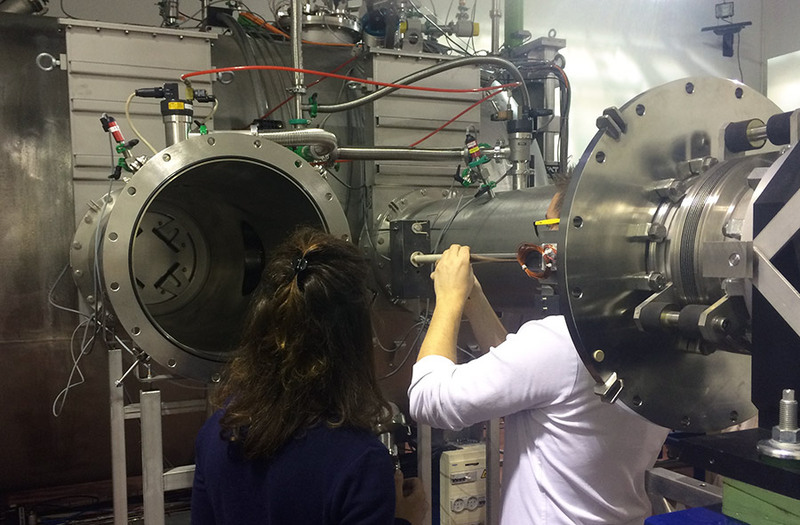 PEPSO is based on a vacuum chamber and a plasma source, and is developed in collaboration with our neighbors ICARE. PEPSO is also used for the training of MASTER students. If you are interested in using PEPSO, do not hesitate to contact us! Installation of a fake nanosatellite equipped with Langmuir probes before its introduction into the plasma chamber.